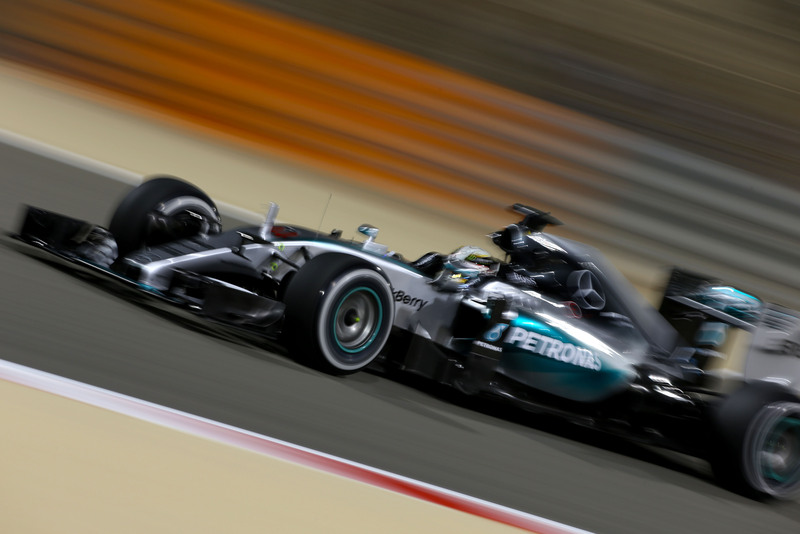 Lewis Hamilton has taken pole position for the 2015 Bahrain Grand Prix at the Sakhir International Circuit. Hamilton continued his run of taking every pole so far this season, with Sebastian Vettel splitting the two Mercedes drivers apart, with Nico Rosberg once again beaten to the front row in 3rd place. With practice pace showing that Ferrari had a chance of fighting Mercedes in the race tomorrow, it was the Scuderia that were the first out on track in the first session of qualifying, with Kimi Raikkonen also the first man to set a quick time. He was soon displaced by the two Mercedes drivers, with Nico Rosberg leading his team-mate by 3 tenths of a second. Unlike previous qualifying sessions, every team decided to use the faster soft compound tyre in Q1 in order to ensure their place in the second round. Ferrari used the new tyres to briefly displace Mercedes from the top of the times, with Raikkonen again ahead of Vettel before Hamilton and Rosberg took back their spots in P1 and P2; with a 1’33.928 being enough to keep Lewis at the top for the rest of the session. McLaren had a bitter-sweet qualifying session as they finally advanced beyond round one for the first time this year. 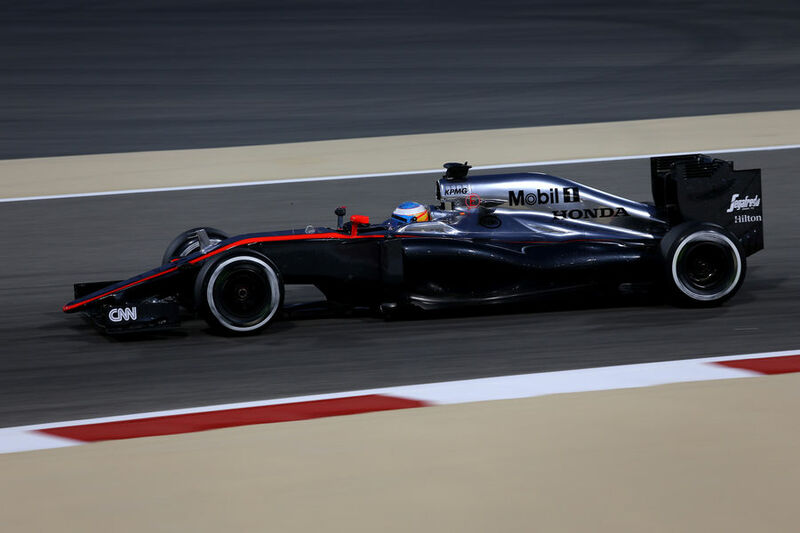 Fernando Alonso put in a cracking lap to take the 9th fastest time and one of the 15 spots in Q2. By contrast, Jenson Button’s torrid weekend continued. Having stopped in both Friday practice sessions, there was a glimmer of hope for Button in Saturday practice when he didn’t grind to a halt. This problems came back to plague him early in qualifying however, with Button unable to set a time after coming to a stop after turn 3. He will start last tomorrow, with the two Manor cars of Will Stevens and Roberto Merhi ahead of him. Joining Button, Stevens and Merhi on the side-lines was another driver who has known nothing but bad luck this year. Daniil Kvyat hasn’t looked happy this weekend and has been cursed with the majority of Red Bull’s engine problems this year so far. His luck wouldn’t improve as he would be eliminated in 17th place, just behind Pastor Maldonado; who despite having had reasonable pace in practice would not advance to Q2. Having topped FP3 and the first session of qualifying, Hamilton’s pace continued to impress in the second session as he laid down a marker on his team-mate Rosberg by setting the fastest time of the session and the weekend so far. A 1’32.699 was 1.2 seconds faster than Rosberg, with Hamilton’s nearest challenge coming from Kimi Raikkonen’s Ferrari. Rosberg was down in 5th, with Massa and Vettel also beating the Mercedes driver. The cut-off to make it into the top 10 shoot-out was very tight, with many drivers improving in the dying moments just to be knocked out again. Having not made it to Q3 this year so far, Force India were looking good at the circuit where they achieved their best ever combined finish last year. Nico Hulkenberg managed to get through into the final session, but Sergio Perez was pushed out at the last moment by Carlos Sainz; who from out of nowhere put in a great lap to take P10. One Spanish driver made it through into Q3, the other did not. Having impressively gotten into Q2, Alonso’s run would end in this session with the 14th fastest time; just behind the two Sauber’s of Felipe Nasr and Marcus Ericsson. Max Verstappen would also join them in elimination after complaining of car handling issues this weekend in his Toro Rosso. With Williams suddenly emerging as another potential challenger to Mercedes along with Ferrari, the final 12 minutes of qualifying began with Vettel setting the early benchmark in the #5 car. Hamilton, once again, would soon take the top-spot after the first runs, with Daniel Ricciardo impressively just 3 tenths behind in P2 ahead of Rosberg, Bottas and the Ferrari’s. It was unlikely that Hamilton’s first run would be enough for pole as it had been in the last two qualifying sessions, as the British drivers time was 6 tenths slower than his best time in Q2. Sure enough, Hamilton’s time would soon be beaten by Sebastian Vettel who put his car half a second quicker than Lewis. Bottas soon came through to further displace Hamilton, with the second Finn of Kimi Raikkonen then also beating Lewis. Nico Rosberg soon came through and was aiming to make it his 3rd pole position at Bahrain in a row. He wouldn’t be able to do it however as he went 2nd fastest behind Vettel. Vettel was within a shout of taking his first pole for Ferrari, but the last driver on a lap was Lewis Hamilton and he made it stick. 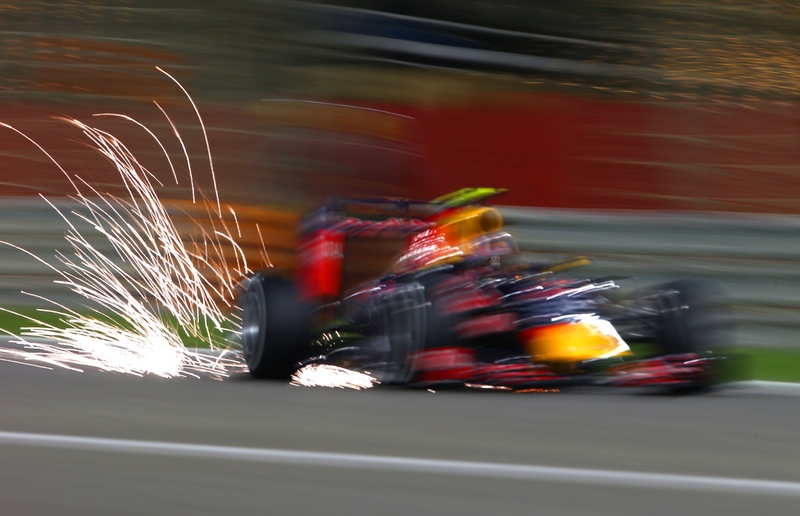 A 1’32.571 was enough to take his first pole in Bahrain and his 4th pole out of 4 this year by 4 tenths of a second. Sebastian Vettel’s excellent lap means that he once again splits the Mercedes drivers. After this impressive performance, it will be interesting to see whether Ferrari can challenge Mercedes after showing good race pace in practice like they had done in Malaysia. Nico Rosberg will start a disappointing 3rd after being beaten by Vettel for the second time this year in qualifying. Kimi Raikkonen will be hoping that he too can take the fight to the Silver Arrow as he starts in 4th ahead of fellow countryman Valtteri Bottas. Felipe Massa qualified just behind his Williams team-mate in 6th, with Daniel Ricciardo not too far off of the pace in 7th for Red Bull. Nico Hulkenberg took his best qualifying result of the year in 8th, with Carlos Sainz and Romain Grosjean completing the top 10 on the grid.